Arctic sea ice is declining rapidly, yet Anthony Watts sez it may rebound! Is he claiming that an ice age cometh? Not really. He usually leaves that nonsense to his "essayists" like David "funny sunny" Archibald. Yet if you read his headline without the article he copied and pasted (archived here), that's the conclusion you'd draw. The authors had a poster on this subject at AGU14 , which can be downloaded from ResearchGate. And there's also an online copy of the paper. When will the Arctic be free of ice? ...The model becomes seasonally ice-free at 2◦ C of warming, and it becomes perennially ice-free at 6◦ C (Figure 4b). These values compare with comprehensive GCM results from Armour et al. (2011), who find the complete loss of winter and summer ice to occur at 4◦C and 7◦C, respectively. If we keep going the way we are, it's not just the summer ice that will disappear, the winter ice may also disappear in only a few decades - maybe as soon as early in the 22nd century. Your young children may witness this if they manage to survive a six degree world. The authors found that there was linear decline from seasonal ice free to perennial ice free, as the earth warmed. Same for when they reversed it and cooled the earth. There was a smooth transition to increased ice coverage as the temperature went back down. What they did was combine two simplified modeling approaches, SCM [seasonally-varying single-column models] and EBM [annual-mean latitudinally-varying diffusive energy balance models]. The SCM factors in seasonal variation and the EBM is about spatial (latitudinal) variation in energy balance. These models on their own each suggest a tipping point may be reached when the Arctic seas tip irreversibly into an ice free state. It's worth noting that the authors point out that general circulation models (GCMs) typically don't find a tipping point. GCMs suggest a more or less smooth transition to an ice free Arctic as the temperature rises. It's only in the two simplified models discussed that hysteresis is indicated, with a tipping point. The authors model combined seasonally varying sea ice thickness (the SCM approach) with spatial variation in energy balance (the EBM approach) - an "idealized representation of sea ice and climate with seasonal and latitudinal variations in a global domain". They described it as "taking a small step from conventional idealized models toward comprehensive GCMs and ultimately nature." What they found was that sea ice cover may be significantly more stable than sometimes suggested. That's not to say that sea ice isn't on a steep decline. What it means is that the system as a whole doesn't tip from one state to another, with no easy return. Understanding of the underlying physical mechanisms was developed by considering the effects of spatial and temporal variations separately. 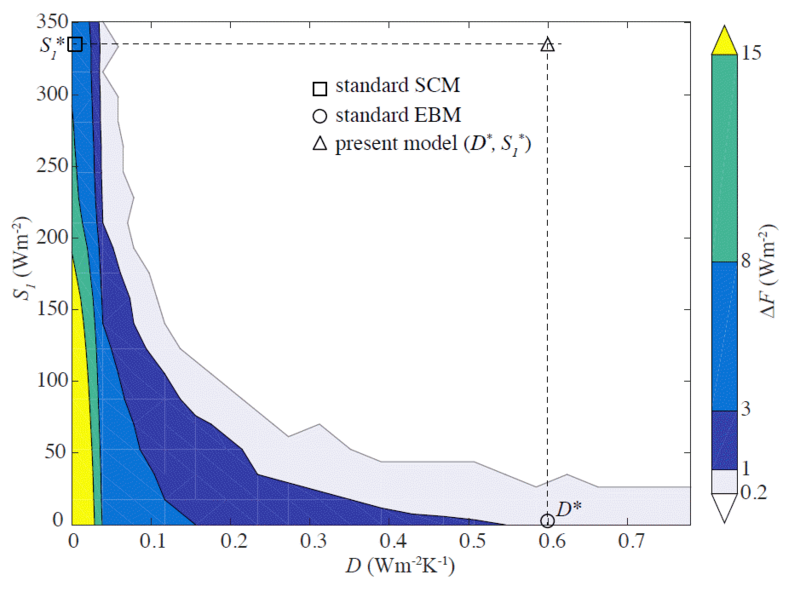 To this end, we studied the parameter regimes for which the model reduces to a traditional EBM and SCM, respectively. We constructed a potential for the system with two wells separated by a hump, and we showed that horizontal diffusion smoothes the potential, reducing the height of the hump. Meanwhile, we argued that the seasonal cycle in the forcing can be approximately visualized as periodically pushing the system up the sides of the well. The larger the seasonal cycle, the higher the system is pushed, and at a critical value of the seasonal amplitude the ball will pass over the hump and seasonally transition between the two wells, thus creating a single seasonally-varying stable equilibrium. The combination of smoothed potential wells and seasonal variations eliminates the possibility of any bistability when both parameters are increased to even relatively small values. It is worth emphasizing that the present model contains substantial nonlinearity, including the ice-albedo effect and factors associated with sea ice thickness changes. Such nonlinearity has been shown in SCMs to lead to both accelerating sea ice loss and bifurcations. Nonetheless, the present model simulates sea ice loss which is not only reversible but also has a strikingly linear relationship with the climate forcing as well as with the global-mean temperature. This is in contrast with SCMs [idealized single-column model] and EBMs [idealized latitudinally-varying diffusive energy balance models], and it is consistent with GCMs [comprehensive global climate models]. The results presented here indicate that the nonlinearities in the model are essentially smoothed out when latitudinal and seasonal variations are included. Given the way we're heading the findings offer small comfort. To stop Arctic sea ice from melting means stopping global warming. There are so far some 148 random "thoughts" at WUWT, most of them empty rubbish of the denialist kind. Talk about confirmation bias and motivated reasoning, emsnews doesn't have a clue. The ice is not growing at both poles. It's melting at both poles. (He's probably confused because the sea ice around Antarctica has been increasing a bit). As the planet gets colder, they notice the ice is growing at both poles! Wow. Absolute geniuses. Now if only they can say this, ‘Global warming isn’t happening, we are now in a long term cooling cycle’ and I will give them a cookie. whatever is happening, it is for sure worse than we thought. no matter how bad we imagined it might be, it is so much worse. infinitely worse and then some. The loss of arctic sea ice is actually a negative feedback as the ice insulates the water preventing it from losing heat to space. Like Anthony Watts, Gonzo didn't take the time to understand the press release, he probably didn't read past Anthony's wrong headline. This has all the trappings of a “walk back from the edge” paper! I’m sure they’ll ask for additional funds to do more research which they’ll find “natural” mechanisms are stronger than previously believed and current models don’t incorporate these well and we’ll need some more funding. The never ending govt/science industrial complex at work. another cherry picked data point from a biased source that focuses only summer ice and not corresponding winter ice which perhaps one might average if shifts were more extreme as opposed to parallel? MarkW doesn't have a clue about the Holocene. His timescales are as wrong as his temperatures. 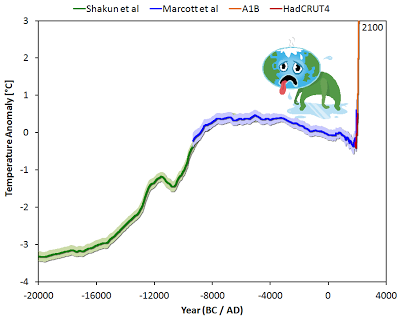 At least 3 times in the last 5000 years, the planet has been as much as 3C to 5C warmer than it is today. Yet arctic ice recovered. Check out the Y axis temperature scale. It's 15,000 years since the earth was three degrees colder. It's as hot now as it's ever been in the Holocene. It's not been one degree hotter than the hottest in the Holocene - but soon will be. I guess that, as he wrote this sorry stuff himself, poor Anthony cannot pretend he let this article get past him as an 'exercise for his readers to spot'. So will he brazen it out and rely on his remarkably unsceptical audience to ignore his stupidity? Or will he go the Heartland/McIntyre route and blame some unjustified confusion on the part of evil IPCC agents and issue a 'clarification'. Going by past experience, he'll brazen it out. Anthony rarely admits his numerous mistakes. He just repeats them. He only admits them when enough of his fans complain. His fan base keeps dropping in quality, so don't expect him to do anything but refer back to the article in the future - saying - "look see, Arctic sea ice is about to come back". 1) Here we have potential good news but so many of the idjuts are stuck on saying it must still be bad news because ... "alarmists". 2) It's based on MODELS. They then take that rather sudden and out-of-character trust in MODELS and implicitly extend it to all postulated climate tipping points. One guy said something along the lines of: See, we've been saying this for years! 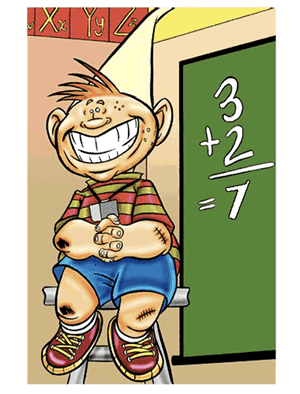 To which I replied: Well, since all models are always wrong, I'd hardly call that prescient. The response is priceless: There you go, making yourself look dumb again. Nobody said that all models are wrong. Just the GCMs. I wouldn't make this stuff up. I couldn't if I tried.